Forty-five percent of women spend over $200 per year on cosmetics to look their best. As part of the POPSUGAR Insights Q2 2014 beauty study, we asked women to tell us where they most frequently purchase their cosmetics. Sephora rules when it comes to women who took our survey. Thirty-eight percent of women said that they most frequently purchase their cosmetics at a Sephora, ranking it first overall. 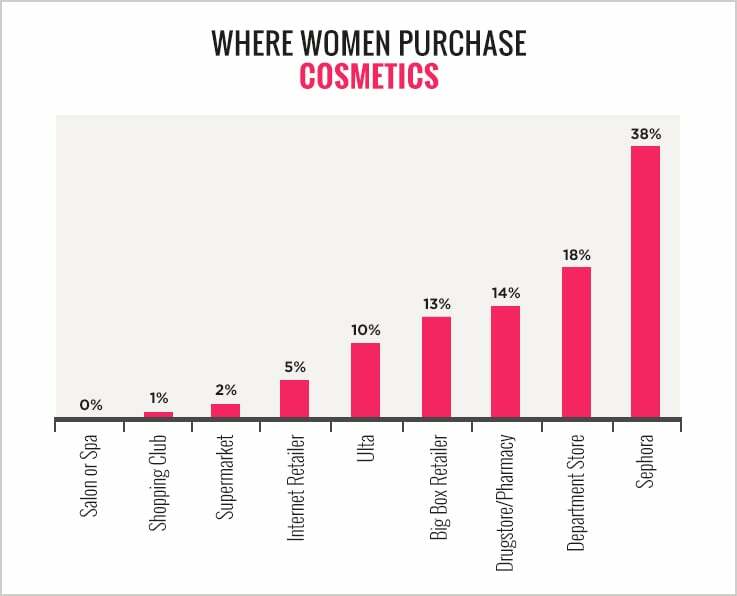 Department stores ranked second overall, with 18% of women frequently purchasing cosmetics at that location. Drugstores and pharmacies ranked third overall (14%), followed closely by big-box retailers like Target or Walmart (13%). Ulta was the second individual retailer to rank highly, with 10% of women purchasing their cosmetics at an Ulta location. Only 5% of women purchase their cosmetic products via an Internet retailer.